Update: The latest Gartner Magic Quadrant of Analytics and Business Intelligence Platforms is here! Read the latest report. 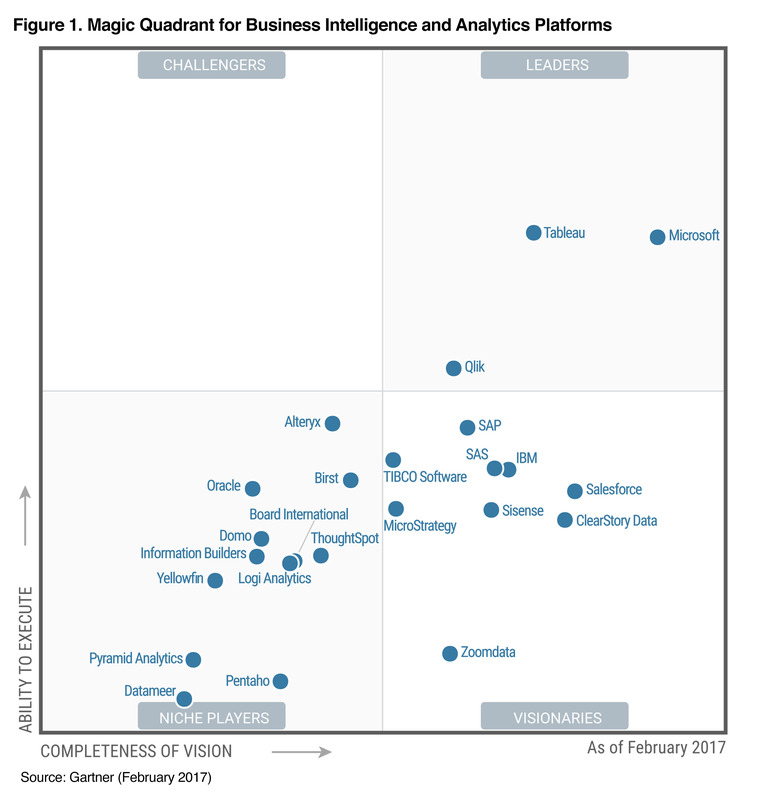 We’re proud to see that Tableau is a leader in the Gartner Magic Quadrant for Business Intelligence and Analytics Platforms for the fifth consecutive year. This year, Gartner has positioned Tableau as highest in ability to execute once again. Tableau is the gold standard for intuitive interactive visual analytics and an established enterprise platform. We wouldn’t be here without our customers’ input, support, and continuing encouragement to solve more of your data challenges. You are the inspiration for our work. Thank you. Our leadership in the industry is a signal of the progressive changes that organizations around the world are pursuing with modern analytics platforms like Tableau. The difference is clear: Our analytics platform is a transformational product that changes organizations by providing self-service analytics at scale. Companies like ExxonMobil and PepsiCo are seeing massive time savings with Tableau. Others like Skyscanner are using Tableau to leverage huge volumes of data in the cloud. In fact, over 54,000 customers have adopted Tableau to answer more questions of their data. And we’re now seeing our customers go even bigger with Tableau by enabling more people to see and understand their data, which we believe is reflected in this year’s Magic Quadrant. For us, helping people see and understand their data has been our only mission all along. It’s what we do every single day. We work to empower people who know the data to ask their own questions of the data. When we first started, we set out to revolutionize the way that people think about analytics. We had a lofty vision: that everyone, not just specialists, should be able to see and understand data, that analytics should be visual and intuitive. We disrupted the market when we introduced VizQL, our first innovation, and we redefined the way people interact with their data. Our continued leadership is a testament to the success our customers have had using Tableau. Companies like Honeywell, Deloitte, and JPMorgan Chase are using our modern analytics platform to empower people across the organization and drive business impact. It’s customer stories like these that keep us energized and inspired. We continue to devote the largest industry percentage to R&D because we’re even more excited about what’s next. For us, analytics isn’t just a market; helping people see and understand their data is our mission. Every single dollar of R&D goes toward this mission, and we’re just getting started. Here are five ways we are innovating our modern analytics platform to be even faster, easier, and more intuitive to broaden the use of data and analytics in organizations. Having a self-service environment where everyone can surface data is a great thing—as long as you can determine when to use what, and which data sources are trustworthy for the task at hand. That’s why we’ll introduce certified content to help both IT and business users. It allows IT to define governed data sources including defining the proper joins, security rules, and performance optimizations as well as create the standard calculations the rest of the organization relies on. And business users can select a certified data source and be sure the data is accurate and trustworthy. We are also enhancing our products to support agile data modeling so you can understand how your centralized data models are used by your users. You’ll be able to perform visual impact analysis to help you understand the impact of any changes you might make to the data source. To help address growing data needs, we are building a new in-memory data engine with Hyper, the fast database technology we acquired last year. Hyper enables fast analysis on billions of records and near-real-time data updates. It's designed to simultaneously process transactional and analytical queries without compromising performance. This means you’ll be able to scale to perform sophisticated analysis on large data with incredible performance. Hyper will also enhance Tableau’s hybrid data model. You’ll still be able to connect live to over 60 different sources that Tableau supports. This means you can leverage the capabilities of databases like Amazon Redshift, Google BigQuery, Snowflake, and Microsoft SQL Server, or choose to bring some or all of your data into Tableau with Hyper. We know that getting data ready for analysis is a time-consuming and difficult process. That’s why we’re working on Project Maestro. This new product will make it possible for more people, from IT to business users, to easily prep their data with a direct and visual approach. You will instantly see the impact of the joins, unions, and calculations you’ve made, ensuring that you have exactly what you need before jumping into analysis. Project Maestro will also integrate with the rest of the Tableau platform, letting you centrally govern your data, automate data refreshes, and analyze it in Tableau Desktop, Tableau Server, and Tableau Online. Visual analytics continues to be a central pillar of our R&D efforts as it puts the power of data into the hands of more people. This area is far from being commoditized and there are many innovations that we’re working on to help you think with your data. We’re adding rich features like visualizations in tooltips, drill-down improvements, new chart types including step lines, and the ability to add images to headers, labels, and tooltips. We are giving users more flexibility with legends per measure and nested sorting. We’re also investing in sophisticated geospatial analysis to help you answer more questions from geographic data. In Tableau 10.2, we are adding spatial file support, and that’s just the beginning. We will also add spatial operations like filters and calculations so you can ask questions like how many customers live within a mile of your store. And with layers, you’ll be able to map different data sets on a single view with just a few clicks. Our advanced analytics features will help you get to the root of your question, no matter how complex it is. We want to bring the power of data science to more users without requiring any programming. You can already perform clustering, forecasting, and trending with a simple drag and drop. You’ll see more algorithms such as outlier detection and sentiment analysis coming in the future. We also want to enable data scientists to bring rich models directly into Tableau. You can now embed R and Python models in Tableau for interactive analysis. In the future, you will be able take advantage of cloud-based machine-learning platforms to bring even more scalable algorithms for interactive analysis. Tableau has made it easier and easier to answer richer and richer questions. But what if we could look at what you’re doing and be one step ahead of you, answering new questions for you automatically, helping you interpret what you’re seeing, or suggesting next steps? We’re adding powerful machine-learning algorithms directly within Tableau to recommend the appropriate views, fields, tables, and joins to help you answer questions more quickly. And soon, we will enable new conversations with data through smart analytics. With natural language processing, you will be able to interact with your data in more natural ways through voice or text. We're also adding machine learning directly to Tableau to make it easier to find the data and views to answer key questions. This will provide recommendations so you can perform better analysis faster. Deploying Tableau needs to be simple and flexible. This flexibility includes allowing you to deploy and connect to your data wherever it lives—in the cloud, on-premises, or both. That’s why we’re expanding the deployment options that you have for Tableau. We’re adding an enterprise-grade version of Tableau Server on Linux. For many organizations, Linux means lower costs, more customization, and a more secure way to run Tableau Server. You can now deploy Tableau Server on public cloud platforms including AWS, Azure, and Google Cloud. And of course, you can deploy Tableau on-premises in VM and physical environments. No matter where you are on your journey or which platforms you choose, we will be there to support you. You can also let Tableau run the infrastructure for you with Tableau Online, our managed SaaS offering. We’re adding full cloud authoring in Tableau Online, data-driven alerting, self-service schedules, collaborative discussions, and many more capabilities enabling a complete cloud-based analytics solution. When discussing hybrid deployments, we also need to talk about data. Tableau supports hybrid data connectivity which means that you can query data live without first requiring data movement or you can move some or all of the data within our fast in-memory engine. This approach is supported across all deployment environments. However, when deploying in the cloud, connecting to data on-premises can be a challenge. You don’t always want to replicate the data in the cloud to use it. 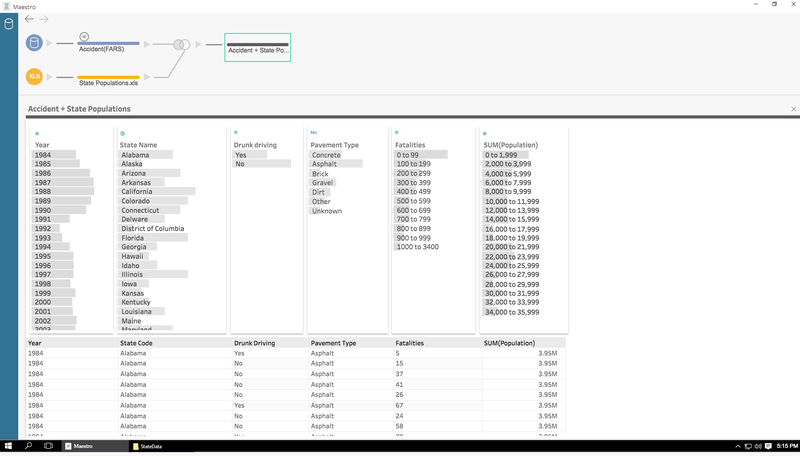 Soon, you will be able to analyze data behind the firewall in Tableau Online using the new live-query agent that acts as a secure tunnel to on-premises data. We are also adding prebuilt dashboards for popular web applications like Salesforce and Marketo. Imagine being able to explore your data in seconds by using one our prebuilt dashboards to populate directly to your Salesforce environment. 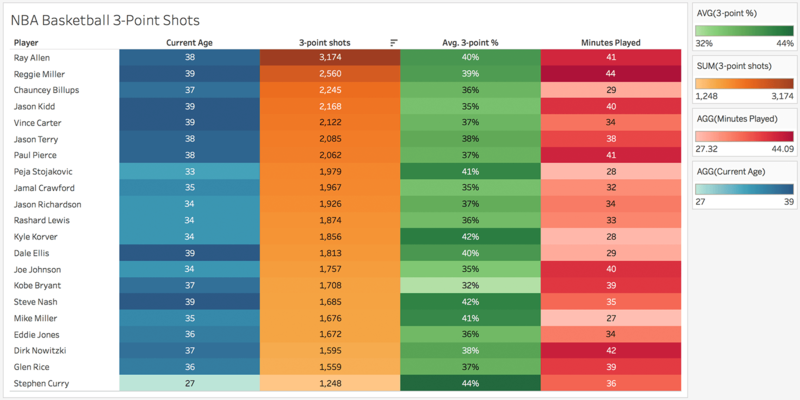 This will make it easier and faster to help you see and understand your data. These innovations are just a small sample of what we’re working on; there’s much more on the horizon. And we invite you to come along on this journey. You are at the core of everything we do here at Tableau. Your needs dictate our work. We listen to your feedback, and with each new release, we build features based on our conversations with you. Please join our pre-release program to test-drive these features when they become available and let us know how they solve your problems. You can also contribute new ideas and join the conversation on our Ideas Forum. Data rockstars, join our conversation on social media. Tag a #DataLeader—it can be anyone!—and tell us why. And we’ll send the data leader a fun avatar as a token of recognition. Share on your platform of choice: Twitter, LinkedIn, or Facebook. The above graphic was published by Gartner, Inc. as part of a larger research document and should be evaluated in the context of the entire document. The Gartner document is available upon request from Tableau. Gartner does not endorse any vendor, product or service depicted in its research publications, and does not advise technology users to select only those vendors with the highest ratings or other designation. Gartner research publications consist of the opinions of Gartner's research organization and should not be construed as statements of fact. Gartner disclaims all warranties, expressed or implied, with respect to this research, including any warranties of merchantability or fitness for a particular purpose. It sure seems like Microsoft is positioned as the leader as they now out rank Tableau on vision.